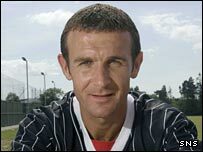 Jim McIntyre has completed his move to Dunfermline Athletic after negotiating a severance package from Dundee United. The 34-year-old striker became manager Jim Leishman's second capture in two days following the signing of former Livingston goalkeeeper Roddy McKenzie. "I've known I've been leaving United for some time," said McIntyre, who had been told to find himself a new club. "I had other offers, but I've always enjoyed playing at Dunfermline, who are a big club with a big fan base." McIntyre, who has signed a two-year contract, spent five years with United, having previously been with Airdrieonians, Kilmarnock and Reading. But he managed just one goal last season after an injury-hit campaign and did not figure in new manager Craig Brewster's plans. However, he told BBC Sport: "Managers come in with different opinions of players, so I have no hard feelings and wish United well. "But I feel as fit as I have ever done. "And when a manager shows he really wants you, as Jim Leishman did, that's important. "Both United and Dunfermline have fought relegation in recent years, but with the squad Jim Leishman has brought in, I think he means business. "Injuries payed a part for Dunfermline last season. "But, if we can keep a nucleus of the squad injury-free, we have every chance of a top-six finish." McKenzie had decided to leave Livingston after their relegation from the Scottish Premier League. "There were a lot of problems and there were a lot of things I wasn't happy with," he said. "I had a clause in my contract that allowed me to leave if we were relegated and I decided to free myself. "Now I'm feeling as fit as I have done for 10 years and have joined a squad of very positive players." Meanwhile, Leishman is continuing negotiatons with Dutch goalkeeper Dorus De Vries. The 25-year-old De Vries had been with Den Haag for the last three years. Should he sign, it could place a question mark over the future at East End Park of former Clyde goalkeeper Bryn Halliwell. The Englishman was back-up last season to Allan McGregor, who was on loan from Rangers.